The Colorado Humane Society (CHS), a program of the Dumb Friends League, provides services to our community through animal cruelty investigations and education. When we think of this department, our focus is often on the compassionate work they provide to some of our most vulnerable citizens – our cats, dogs, and horses through their investigations of cruelty and neglect. But, what we don’t often understand is the collaborative work that is completed across the state of Colorado to help provide education to animal control officers, veterinarians and law enforcement on how to best help pets, horses and their owners across the state. Colorado Humane Society agents and local law enforcement officials are commissioned by the Colorado Bureau of Animal Protection, which requires officials to complete training that can be difficult to come by and costly for some agencies. Understanding that outreach is vital to educate law enforcement officers about animal laws and welfare, CHS offers these required classes, free of charge to agencies across Colorado. By providing educational resources to animal welfare groups and veterinarians, we are ensuring that animals receive the care they need and that they receive help should they be in a situation of neglect or abuse. Trainings provide skills ranging from Body Condition Scoring and Animal Husbandry to Forensics in Animal Neglect & Cruelty Investigations for Investigators and Veterinarians. Officials participating in these sessions receive skills and knowledge to help them successfully aid animals–thus, improving animal welfare on a much larger scale than CHS could ever manage on our own–collaboration at its finest! How do agencies across the state learn about these training? Some reach out to CHS, and we sometimes reach out to them. 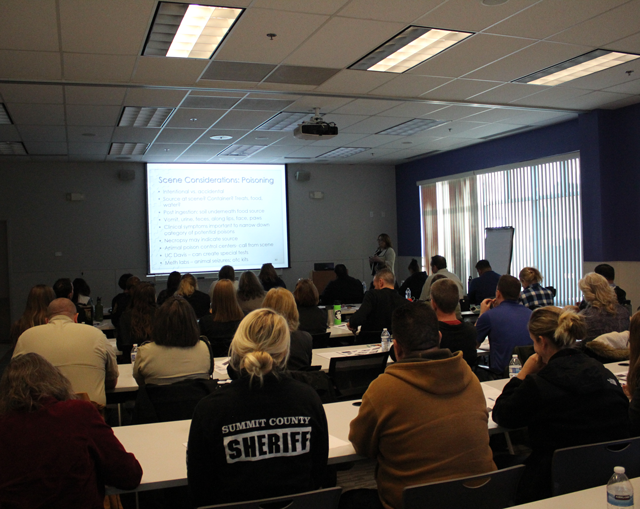 Our animal cruelty investigators, along with partner veterinarians and animal welfare experts, teach the trainings. CHS investigators have traveled from metro Denver all the way to Pitkin, Colorado (and beyond!) helping officers protect and serve our pets and horses to their best capacity. And, in addition to offering these trainings at no cost, CHS occasionally offers lodging scholarships for agencies that have travel needs requiring overnight stays but do not have the resources to do so–pretty neat. It’s a big job, but one that we’re happy to help with. Read about how CHS continues to educate and help animal owners throughout Colorado. To learn more about CHS or to make a gift to help us continue to these trainings, visit coloradohumane.org.